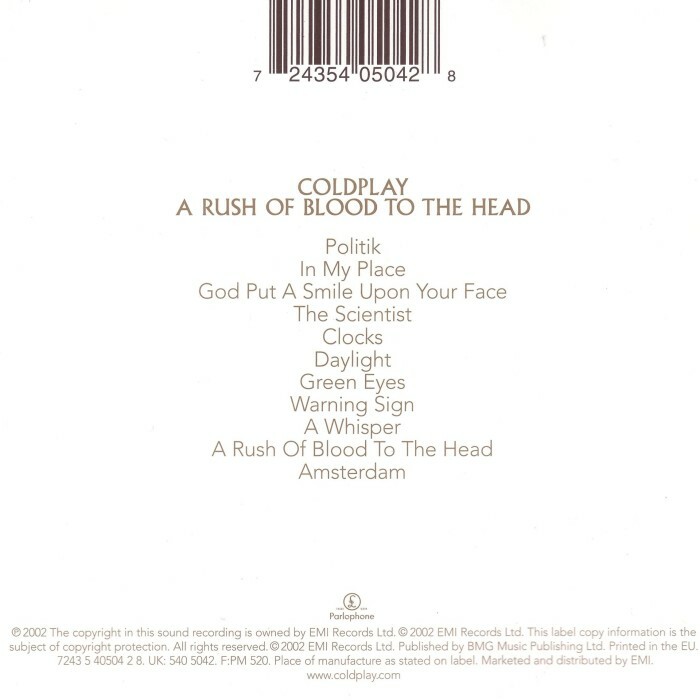 A Rush of Blood to the Head is the second studio album by British alternative rock band Coldplay. Released on 26 August 2002 in the UK through the label Parlophone, the album was produced by the band and British record producer Ken Nelson. Recording started after the band became popular worldwide with the release of their debut album, Parachutes, and one of its singles in particular, "Yellow". Attitudes to songwriting were affected by the September 11 attacks in the United States, which occurred the week before recording started. The songs featured in the album have a greater use of piano and electric guitar than its predecessor. The album was made available in August 2002, two months after its original planned release date. It was released on 27 August in the United States through Capitol Records. Capitol released a remastered version of the album in 2008 on a 180-gram vinyl record as part of the "From the Capitol Vaults" series. The album debuted and continued their huge commercial legacy, an ongoing pattern that began with Parachutes which made Coldplay one of the best-selling bands worldwide. It topped the UK Album Charts upon its first week of release in the United Kingdom, and became the eighth biggest-selling albums in the 21st century in the UK. The British Phonographic Industry has since certified the album 9x platinum for its accumulated sales of over 2.7 million units in Britain and over 15 million worldwide. The album spawned the hit singles "In My Place", "The Scientist", "Clocks", and "God Put a Smile upon Your Face". A Rush of Blood to the Head has been critically acclaimed, and it won the band the 2003 Grammy for Best Alternative Album for the second time in a row, successive to their previous win in the same category, and the 2004 Grammy for Record of the Year for the song "Clocks". In 2003 it was ranked number 473 on Rolling Stone's 500 Greatest Albums of All Time. 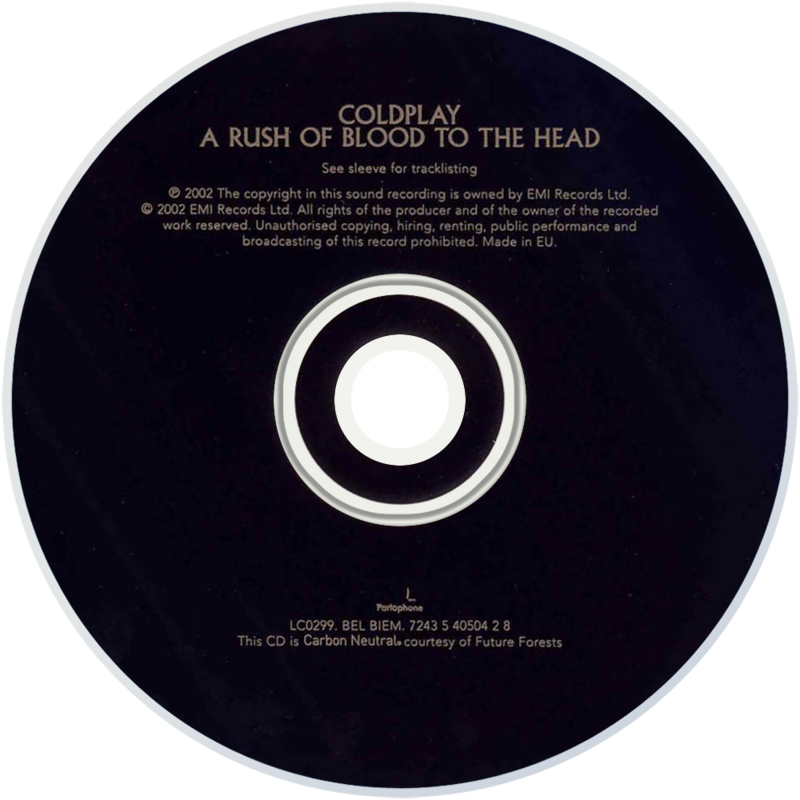 Perhaps unsurprisingly, Coldplay's new album A Rush Of Blood To The Head is a consolidated evolution from their comparatively naÃ¯ve debut, Parachutes. The die-hard Coldplay fans looking for another Parachutes and the bloodthirsty critics who demand to see some progression will all walk away happy. A Rush of Blood to the Head is inimitably Coldplay; Chris Martin's familiar vocals, the band's signature harmonies, strings and piano are all there but disarmingly there is a lot more to this album. It's undoubtedly the album we all expected but it's also smarter; more poetic, more mature. "Politik", the album's opener makes for a driving, imposing start with Martin's distinctive vocals reverberating eerily above urgent piano chords. It's unusually dramatic for a band once dubbed by ex-Creation mogul Alan McGee as "Bedwetters". The second track, the first written post-Parachutes and sounding like a refugee from that album, is the grower "In My Place". It's a fantastic pop tune that justifies Coldplay's status as one of UK's most exciting bands. The haunting, surprisingly cynical theme that originates in "Politik" is continued in "God Put A Smile Upon Your Face" which sees the band at full stretch, lyrically as well as musically. You can sense them pushing themselves to prove to the world that there is a lot more to Coldplay than chart friendly singles. Then, mid-album, they let all their hard work go to waste with the insipid, vanilla tracks "The Scientist" and "Clocks". They pass you by and fail to raise even the smallest emotion. Daylight" and "A Whisper" find the band back at their best with epic, yet simple melancholic tunes. Here repetitive choruses and hypnotic, violin sounding guitars take the listener on an exciting journey that you wish wouldn't end. Coldplay are a band very much in touch with their emotions, which frequently works in their favour. Martin's heartfelt, passionate vocals on the piano driven "Warning Sign" transform a song which in other hands could descend to the pathetic: "Come on in, I've got to tell you what a state I'm in...The truth is I miss you"
Despite a couple of weak moments this is asuperb album that might just capture your heart and your imagination. Don't struggle; enjoy a rush of blood to the head.